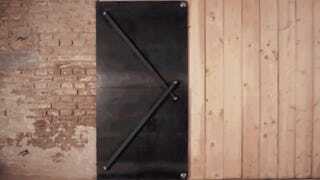 Describing the sculptures of Austrian designer Klemens Torggler as "doors" feels like an insult. These aren't doors—they're magical pieces of engineering, half kinetic sculpture and half magic trick, that you happen to walk through. So, how do they work? You may have seen Torggler's work around before: In his many YouTube videos, the Austrian designer walks nonchalantly through the frame, and with a flick of his wrist, sets a whirling structural maneuver in motion, either closing or opening the door in question. Torggler has been building these doors since 1997—and each one is different. We decided to look at the five main types.